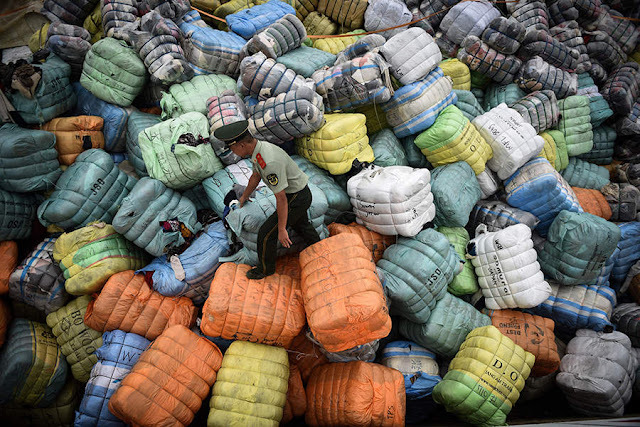 China has officially banned its four-decade long practice of importing foreign garbage in 2018, a move experts believe will promote more sustainable ways to dispose of and recycle waste worldwide. “This ban will send shockwaves around the world, and force many countries to tackle the ‘out of sight, out of mind’ attitude we’ve developed towards waste,” said Liu Hua, Greenpeace East Asia plastic campaigner, in an announcement released by the organization on Dec.29. The remarks come amid China’s ban on imported waste, which took effect on January 1, 2018. First announced in July 2017, the ban prohibits 24 types of waste under four categories: certain types of mining slag, household waste plastics, unsorted waste paper, and waste textiles. Due to the lack of resources in the 1980s, China decided to accept foreign waste and it soon became the world’s largest importer of garbage. According to statistics from China’s Ministry of Environmental Protection (MEP), the country imported 49.6 million tons of solid waste, with scrap paper, plastics, and metal taking up large shares in 2014, while Green Peace’s annual report in 2017 pointed out that up to 56 percent of global exported plastic waste ended up in China in 2012. The large amount of garbage and the process of recycling have led to severe environmental damage and health threats, as well as becoming a hotbed for the underground garbage smuggling industry. “The problem of foreign garbage is loathed by everyone in China. As the economy and society have developed, the drawbacks of imported waste have emerged,” said Guo Jing, chief of the International Department at MEP in December 2017. 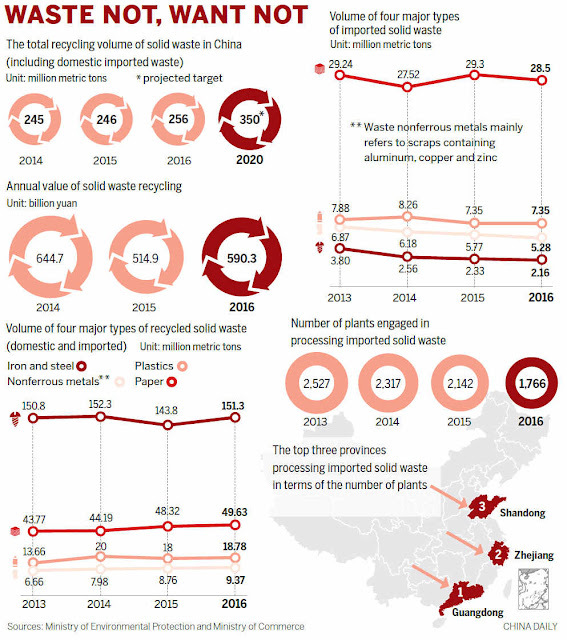 As China has tightened control on imported solid waste, many Western countries are now facing severe recycling incapacity, as well as possible environmental pollution. The leaders of the UK’s recycling industry admitted on Dec. 31 that they had “no idea” how to cope with it as the ban came into force, noting that hundreds of thousands of tons of toxic plastic could be burnt in Britain rather than recycled, according to The Telegraph. “It’s a huge blow for us and a game-changer for our industry. We simply don't have the [recycling] markets in the UK so we do rely on the export markets,” Simon Ellin, Chief Executive of the UK Recycling Association, was quoted as saying by Today in December. Britain currently ships around two thirds of its garbage to China for recycling, approximately 500,000 tonnes each year, according to the Telegraph. “Exporter countries’ dependency on China’s recycling market has been striking in recent years, but it’s time for them to tackle their own waste problem rather than shift the responsibility to other developing countries,” said Lin Ziquan, a Beijing-based environmental protection volunteer. “The world can’t continue with the current wasteful consumption model based on infinite growth in a finite world. Rather than find new places to export waste, governments and the private sector must find ways to simply reduce the amount of waste we are creating,” added Li.